Audio Chandelier as a performance concept/system uses a point-source arrangement of the sounds of a single audio file into 10-16 speakers arranged in asymmetrically in a large space (preferably 20’x20” or larger. Using a computer and granular synthesis, I send one “grain” (very small slice of sound from my audio file), into each sp eaker, and then by subtly manipulating the size and pitch of these looping sound “points”, and various interpolation times, I am able to create shimmering, moving and elastic effects on various types of pre-recorded and live audio as compositional gestures. In performance I use a MIDI keyboard or Wii controllers to control these gestures and also to quickly and rhythmically route additional sounds into the space, treating the speakers as a virtual gamelan orchestra. For an installation version of this work, I hope to design visual treatments for speaker housings to a visual space and analogy to the “chandelier”. There should be at least 16 speakers of various sizes and a subwoofer. My visual collaborator on this next phase of the project is Ayala Naphtali, a metal-smith and designer (and my sister). I also plan to work in consultation with speaker designer Paul Geluso (if possible) or someone at Eyebeam to be sure that we balance the visual and space design with the best and least costly and best sounding options for the speakers. By adding this visual element, I hope to draw participants, not accustomed to sound art, to listen to the sounds in a new way, and to interact with them. I also plan simple interactive elements to the piece taking a cue from the work of Trimpin by adding simple controls that can be touched physically, and would like to add a keyboard or simple controller (nothing too abstract) to make that possible. (I can do all the Max/MSP programming and preparation of these aspects of the project myself). Ayala Naphtali strives for balance and proportion, and feels as if each piece must find its axis on the wearer. The work is designed to be elegant, with minimal and bold forms Ayala’s work is an exploration of form and materials, each equally important. She feels firmly rooted in the historical tradition of her craft. Ayala is committed to the use of materials, for their color texture and versatility. Often the material is the inspiration for the piece of jewelry being designed. Coconut shell, dyed and carved, is used to achieve rich color and texture. Forging, fabricating and casting are used to create pieces with dimension and volume.” Ayala Naphtali was born in NYC from Israeli and Greek heritage. She began making jewelry in her early teens. 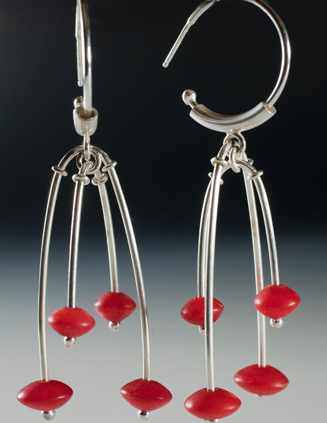 She studied Gold and Silversmithing at FIT and SUNY NEW PALTZ where she received her BFA in 1985. Ayala’s work has been exhibited both nationally and internationally in galleries and museums. She has won awards at Exhibitions nationally. Her work has been collected privately, and by major museums including the Cooper Hewitt and Kunsindustriumuseum in Norway, and The White House permanent collection. Ayala currently exhibits in major nationally juries craft shows such as American Craft Exposition in Baltimore, SOFA show in Chicago and other local venues. Selected publications include American Craft Magazine, ELLE, The Fashions of The Times, The New York Times, Mademoiselle, Women’s Wear Daily, Glamour, and New Women Magazine. Ayala has been a juror for The American Craft Council Craft Shows.